When you talk to craftsmen or designers about things you like in their range, there’s often a particular smile that creeps across their face. Actually, it usually starts as something closer to relaxation. There’s a sense of relief; the shoulders relax; they take a breath, and then the smile starts. And if you mention something you like – some technical or functional point – their eyes will often light up, excited that someone appreciates why the product was made that way. When I meet readers, I always forget to ask useful market-research questions. How they heard of the site, what their favourite type of post is, how it could be improved. But I immediately light up when they say they like one of the products we’ve developed. I know what that relief/pleasure feeling is like now, and I want to know every thought they have: why they like it, how it compares to other things they wear, what they wear it with. This was what happened in the pop-up shop every day. Some of the readers that came in already had an Everyday Denim shirt and wanted to talk about it, while many of the rest wanted to see them in person. I learnt that people were anxious for the shirt to start fading, and sometimes washed it three or four times before wearing it for the first time, in order to get that effect. In fact, two readers asked whether this was a mistake, and was meant to be cut off. Well, no. Just so everyone knows, that stitch is functional and deliberate. If you look on the inside, you will be able to see that the placket is sewn down halfway by hand. In the top half, it is left loose in order to roll open more naturally. The tack stitch is there to finish that line of hand sewing, and prevent it coming undone. So please don’t cut it off. It’s a nice, tiny bit of functional sewing. This is relevant because the Everyday Denim shirts are now back in stock on the Shop site, and for the first time there are shirts in the Lighter Denim as well. 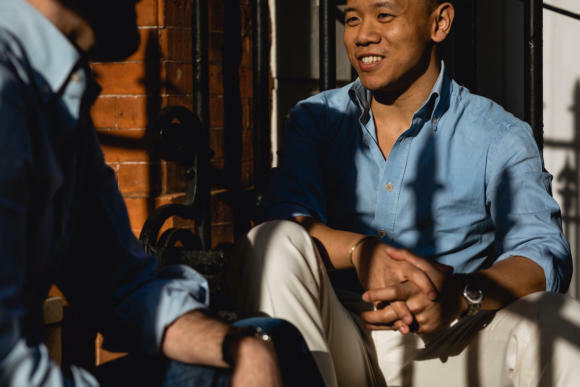 In order to add some illustration and perhaps inspiration around both, Jerry Tong from Prologue (above) and I wore them out on a sunny day during the pop-up, to shoot with Milad Abedi. 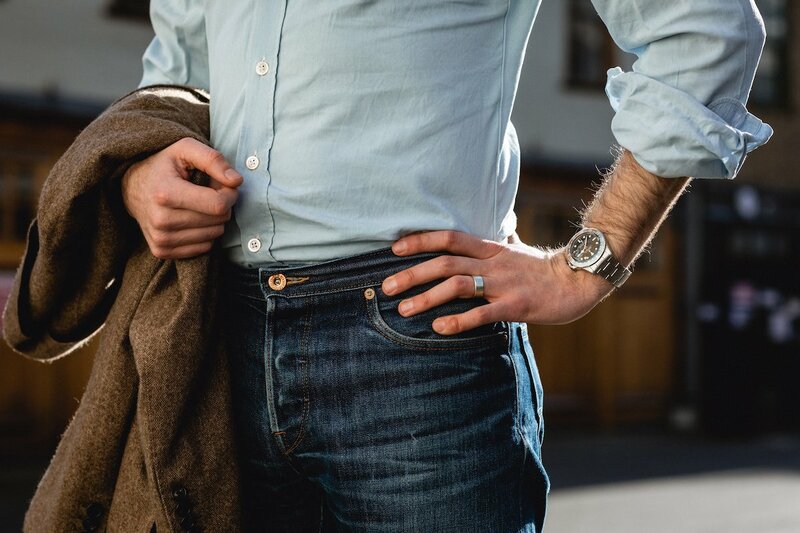 I deliberately wore the Lighter Denim with jeans, to demonstrate a point I’ve made before – that this lighter colour is far enough removed from normal denim to be worn with jeans, and avoid a ‘double denim’ look. Jerry wore the regular Everyday Denim, which probably makes a nicer match with his outfit. 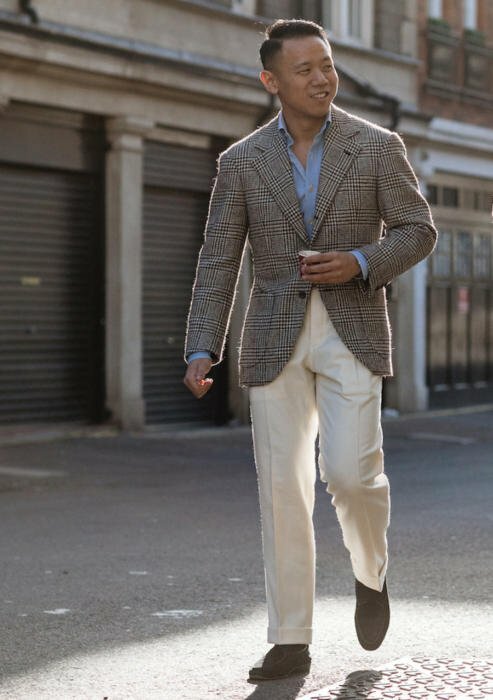 The slightly darker shade is a better partner for the cream trousers, creating a nice bit of contrast between them (see pic above). Both shirts have been worn and washed 8-10 times, and you can see that while the Lighter Denim does fade as well, it’s not as marked as the Everyday. 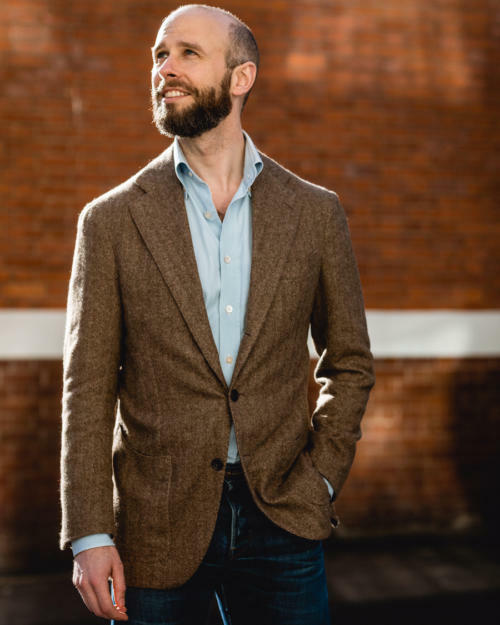 As ever, the shirts are made by Luca Avitabile in Naples, using his curving button-down collar that sits so well around the collar of a jacket when open – and yet also sits proud when worn with a tie. The shirts have several points of hand sewing, focusing on the most important and functional areas. So the sleeve and collar are attached by hand, as is the shoulder. Aesthetic hand-sewn points are the buttons, buttonholes, and points like the back of the placket mentioned earlier. The buttons we use are a smoky mother-of-pearl, which I think gives a slightly more casual and vintage look that suits the denim. The sizing for the shirts is the same on both colours, and as the PS Oxford shirts – though slightly different to the Friday Polos as the material is so different. Sizing chart and other details on the shop page. In the photos here, Jerry and I are both wearing Mediums, which is a pretty good fit on us both despite him being a little shorter and bigger in the chest than me. 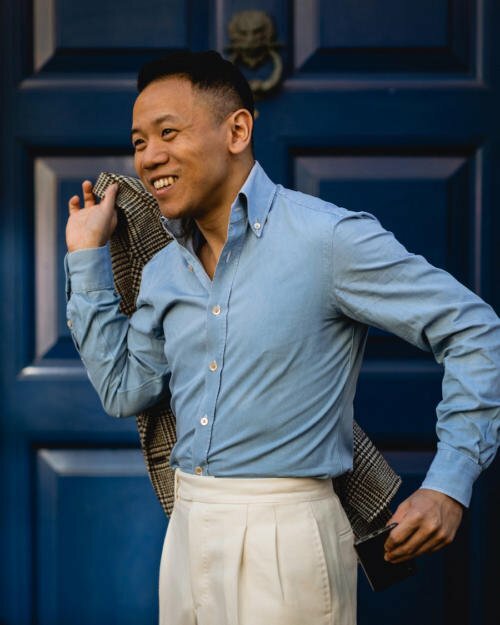 Jerry is also wearing trousers and jacket from his company, Prologue, with the jacket being in a Marling & Evans undyed-yarn cloth that I rather like. I’m wearing my Eduardo de Simone cashmere jacket and Levi’s bespoke jeans. Thank you to everyone that came to the pop-up and told me what they liked, disliked and were confused about. I know why those artisans smile now. There’s nothing quite like making something people love. 'Everyday Denim' is so-called because it is a denim shirt a man in a modern office can wear every day. 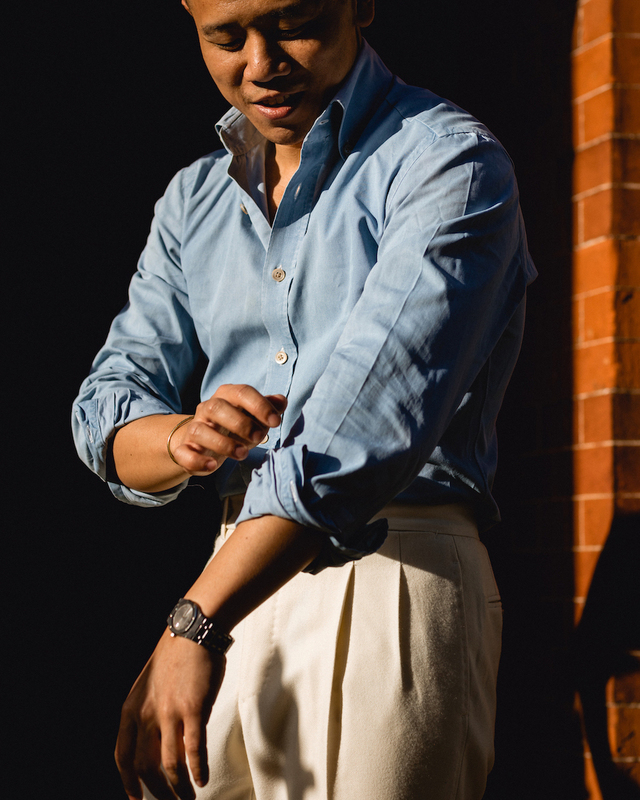 It is made in blue colours similar to a regular office shirt, but rendered more casual by its denim texture. It uses a denim shirting from Albiate (part of the Albini group) that is exclusive to Permanent Style. A re-weaving of a cloth that wasn't commercial enough for mainstream stores because of its fading, but perfectly suits more advanced PS readers. The shirts are made by Neapolitan bespoke shirtmaker Luca Avitabile, using several stages of hand-stitching to give it more of a bespoke fit (eg a smaller, hand-sewn armhole). The cloth is a cotton twill, using 60/2 yarn in the warp and 120/2 in the weft. Being 2-ply is significant with denim, as most brands use cheap, single-ply yarn for denims - but 2-ply softens and wears better. Everyday and Lighter Denim are both also available as raw material, in order to buy and give to a bespoke shirtmaker. The shirts cost £180 plus VAT. As with everything on Permanent Style, the pricing is slightly below normal retail margins. Made in Italy, ships from the UK. The PS Oxford shirts will be in stock again in about two weeks. Email Support@PermamentStyle.com if you want to be on the waiting list. We will also do shirts in the striped PS Oxford cloth, but they won't be ready for a few months. Again, email if you want to be notified about those. There will be a restock of Friday Polos in about two months. There are some left, but with quite a few gaps. Shorts will be back in about a month (with a new, extra colour). Hopefully by the time it's warming up in some places enough to wear them. There are still plenty of Bridge Coats left, but there won't be any more Trench Coats until the Autumn. 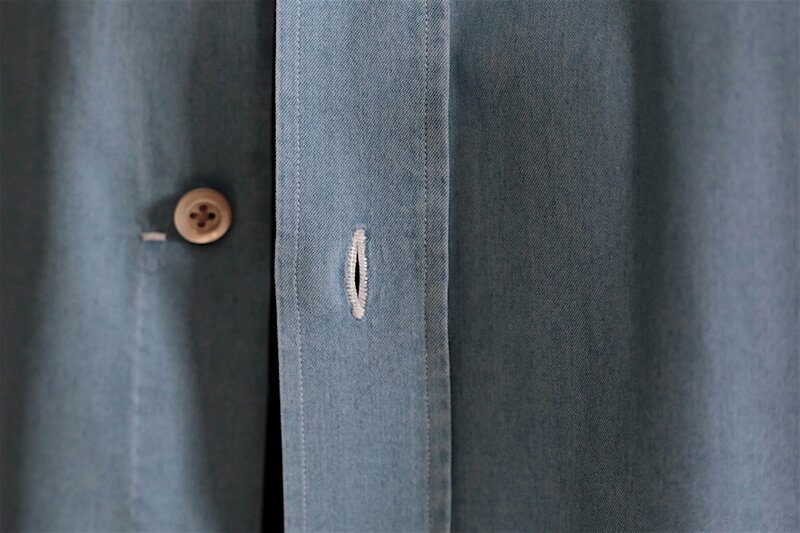 Everyday Denim Shirts and cloth available on the shop site here. Learn more about how Permanent Style’s collaborations work, and how else it is funded, here. 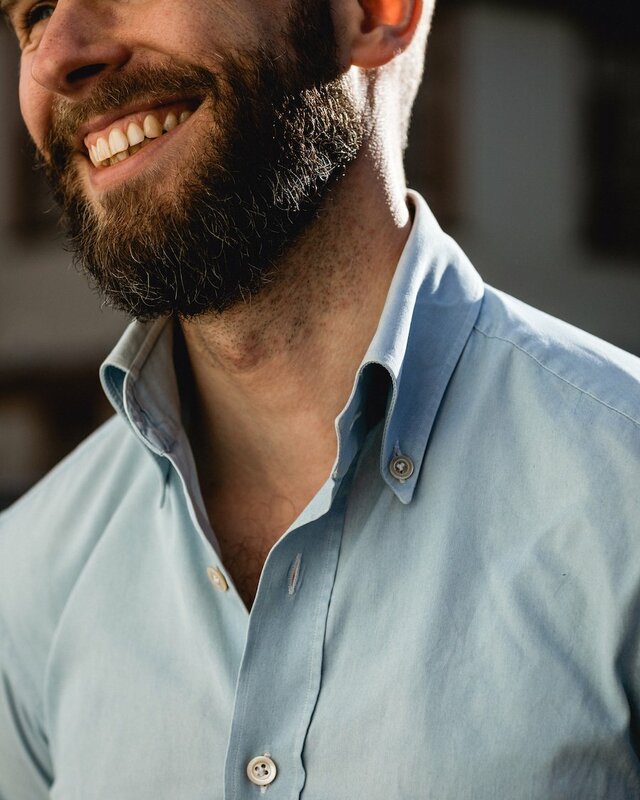 You can follow the discussion on Everyday Denim shirts back in stock, and Lighter Denim for the first time by entering your email address in the box below. You will then receive an email every time a new comment is added. These will also contain a link to a page where you can stop the alerts, and remove all of your related data from the site. Thanks Simon I have been waiting for a re-stock. I just picked up one of each (Everyday and Lighter Denim). Just need some clarification, lighter is referring to color, rather than fabric weight, is that correct? I love the shirt but had an issue, wonder if you could advise. It faded dramatically across the chest and upper back, almost white compared with the sleeves and lower front which faded more slowly. I had machine washed in cold alone or with another similar shirt and delicate detergent, line dried. No idea why this happened. In the end I bleached it and now have a decent off white (tinge of blue) shirt. Still decent. Does this run hot? 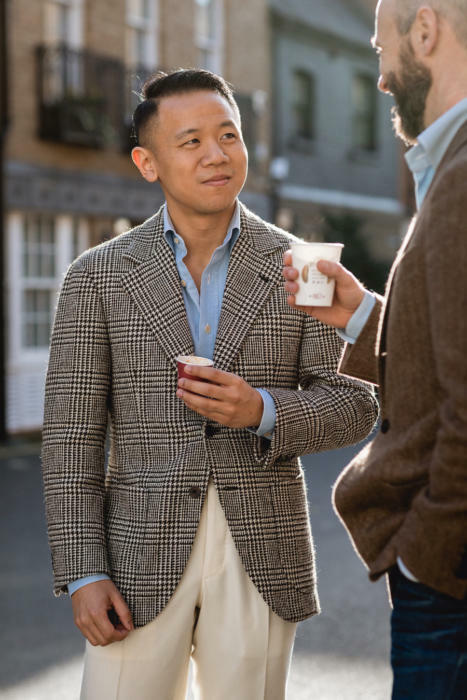 Would lighter one work with khaki linen suit? Good to receive the update on Friday Polos I will keep an eye out for when my size returns to stock. On the EDS, do you have plans to have stock with some stores around London as you did with the Friday Polos? Unfortunately, I could not come to the pop up shop and it would be nice to see them and check sizes before buying. Good to see your denim shirts are back in stock. Please can you advise on what , if anything to allow for shrinkage. Also are they 30 or 40 degree wash? I have been keeping an eye out for the restock of your Oxford shirts and noticed last week that they appeared to be back in stock. I subsequently ordered one in large. This contradicts slightly with your update today. Have I simply preordered? Having recently taken receipt of your everyday denim shirt, I am now, as you’d expect, very impatient for my next acquisition to arrive!! You both look lovely. I caught you leaving the pop up, the day of this shoot. I remember your jeans sat perfectly on a suede spilt toe. Apologies, another question. Are there any details on the back of the denim or Oxford shirts such as pleat or hanger loop. Also are they regular, tailored or slim fitting by design? No, neither pleat nor hanger loop. And of those choices, tailored is probably closest. But a very ridiculous question: What is the difference between formal and informal? I guess shirts in the article is quite versatile? They could be used quite formal as well. Or perhaps I am wrong? Did you ever get your new jeans with the lower front rise made by Liz/Levi’s? Curious how the new fit and fabric worked out. Thanks. Thanks! I was able to grab one. Nice touch with the packaging too. Wondering if you could do a run of oxford shirts, plain but the striped one looks cool too. No worries if not, great shirts though keep ’em coming. 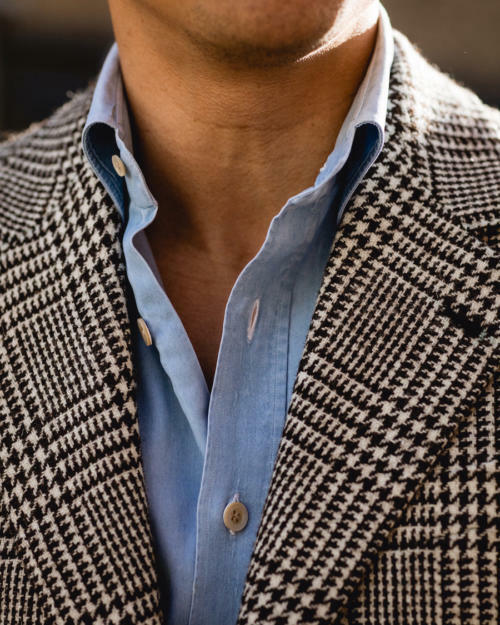 I do also like the polo shirts but I do prefer the usual collar versus spread.